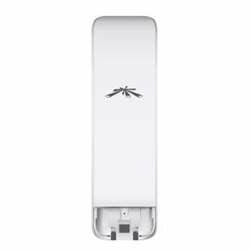 Ubiquiti NSM365 3.65GHz featuring a panel antenna and dual-polarity performance, the NanoStation M365 is ideal for Point-to-MultiPoint (PtMP) applications requiring high-performance CPE devices with a sleek form factor. Dual Ethernet Connectivity, With software-enabled PoE output, the secondary Ethernet port can power an external device, such as a PoE security camera, for seamless IP video integration. Ubiquiti versatile airOS firmware technology enables high-performance, outdoor multi-point networking. airOS provides features such as wireless settings, bridge or routing configuration and system management services. Ubiquiti NSM365 Indoor/Outdoor airMAX CPE requires no tools for assembly; only a single wrench is required for pole-mounting.